Her name still spellchecks as “Ivan” but it will soon become the word that describes a new style of feminism in which women not only survive but thrive in today’s world of misogyny. Throughout 18 months of presidential campaigning, Ivanka Trump has nimbly negotiated her way over the ruts of her father’s inbred prejudice with finesse, tiptoeing around the aftershocks of his comments about women, the handicapped, Mexicans and Muslims with a laser-targeted vision that has kept her own professional ambitions firmly on track. By adhering to general praise of her father, she has steered clear of his stains of shame and avoided being mired in the unpleasantness of detail, to the point that she might well be inducted into the sisterhood of one-named fame that includes Oprah, Evita, Madonna and Cher, and thereby deflect the controversies attached to her surname that are bound to head her way for the foreseeable future. Her presence at Japanese Prime Minister Shinzo Abe’s meeting with her father dramatically broke barriers in protocol-conscious Japan. Fruitless years of fighting for the rightful place of women within the professional classes were instantly erased with a little black dress of timeless elegance. Hand-blown shards of ceiling glass tinkled to the ground in a way that a female ex-Secretary of State could not achieve through the sledgehammer of intellectual reasoning, a lifetime of public service and a pantsuit. 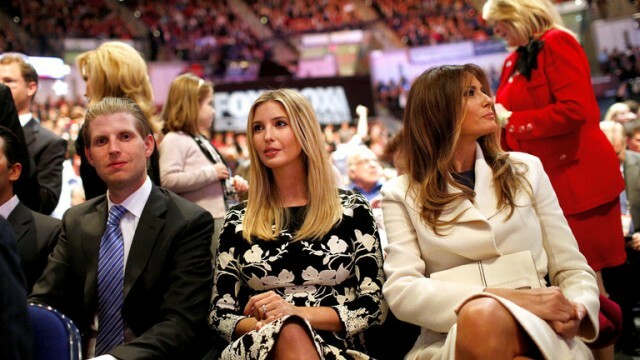 Ivanka uses her inherited thick skin to her advantage, less tanned but equally gamma-rayed against criticism when she sits in on meetings for which she is supremely unqualified to attend. When pregnant earlier in the year, she remained unfazed by her father’s imploring to give birth in a primary state; instead she did so in her home state of New York and encouraged women to have “lives uniquely their own and not based on the expectations of anyone other than themselves.” And she successfully convinced her father to maintain his qualified support for Planned Parenthood despite Republican opposition. She also shares the same mind-bending talent for rationalising bigotry; “People ask me from a gender perspective, ‘He said this and this about women,’ and I’ve said, ‘Have you looked at the things he’s said about men? Why would our gender be treated differently?’” Makes sense, if it weren’t so wrong, but a good tool, nonetheless, to cut through the outrage that often prevents women from pursuing their goals. Physical looks as part of Ivanka feminism are also important. The allure of a well-groomed and dressed proponent speaks volumes about her controlling position. While her father rants and raves on Twitter, she uses her account to market the Trump Organisation and her own line of women’s clothing and accessories. When Kim Kardashian’s rear end is a symbol of legitimate self-expression, it is no surprise that women negotiate new terms of how to become successful. Ivanka’s recent modelling of a $10,000 bracelet from her own collection on American current affairs programme 60 Minutes was a tad conflictive, strayed into the seriously tacky and backfired on social media, but still filled the business coffers with subsequent sales. Moreover, when the World Economic Forum predicts that it will take 170 years to reach gender income equality, women are looking for shortcuts. Ivanka is seamlessly transitioning from the world of clunky, hardwired machismo to one of smooth and speedy results-based respect for women. She has trumped the Trump himself and remains unscathed and un-traumatised by male weakness. Her presence at Shinzo Abe’s meeting with her father broke barriers. Shards of ceiling glass tinkled to the ground in a way that a female ex-Secretary of State could not achieve through reasoning, a lifetime of public service and a pantsuit. Ask millennial women about Ivanka and many shrug casually without animosity. About half of Americans view her favourably, and another 21% have no opinion of her, according to an election 2016 Gallup poll. She has successfully shaken off the disgust they feel for her father’s insults by not allowing his flaws to define her, and that in itself is empowering. Trump’s exorcism of political correctness may have turned into racism, but his sexism has emancipated his daughter. Her devotion to the damaged Neanderthal that is her father is recognised by all those with difficult family dynamics. “My father has an enormous heart and truly loves people – all people.” She holds, if not the reins to his irascibility and narcissism, then the formula that makes Frankenstein’s creature stop in mid-careering – the dulcet tones of reason from a voice that loves and understands him. So, like Mary Shelley’s pathetically flawed beast, Trump might have fancied his daughter, yet she controls his loyalty. And, in his struggles between sounding civilised and barbaric, he singles her out from the women he assaults, and puts her on a pedestal of alpha female role model. She might have been born into immense wealth but she is no “poor little rich girl”. Onwards and upwards while firmly in the driving seat, Ivanka horsepower might even take a new generation of women with her. Hugh Jackman is down with the Trumps – but does it matter?